Storey Publishing, LLC, 9781635860115, 200pp. Levin demystifies the process of selecting the right combination of meat, temperature, and wood to achieve the ultimate flavor and texture. Detailed step-by-step photos show the various techniques, including cold-smoking, hot-smoking, and pit roasting. A survey of commercially-available smokers critiques the features of each one, and for readers with a DIY bent, Levin includes plans and diagrams for building a multipurpose smokehouse. Featured recipes include specialty brines and rubs along with preparation guidelines for all the classic cuts of meat, including ham, brisket, ribs, bacon, and sausage, as well as fish and vegetables. With in-depth troubleshooting and safety guidelines, this is the one-stop reference for smoking success. 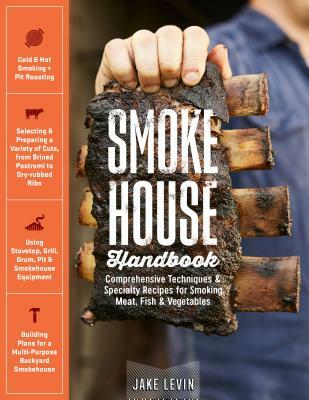 Jake Levin is the author of Smokehouse Handbook. A butcher and charcuterie expert who trained at Fleisher’s Meat in Kingston, New York, he has worked in whole-animal butcher shops including The Meat Market in Great Barrington, Massachusetts, and Eli’s Manhattan in New York City. He currently produces cured meats at Jacuterie, an artisanal charcuterie in Ancramdale, New York, and travels nationwide conducting workshops on how to slaughter, butcher, and cure meats. He and his wife live in New Marlborough, Massachusetts, and his website is therovingbutcher.com.